Advances in the flooring industry mean that materials and products are more durable than ever before. Greer Flooring Center, Inc. is proud to offer quality resilient flooring in Greenville, SC. Just as the name suggests, this option proves resilient in even the most active households and businesses. Unlike traditional vinyl tile of years past, this vinyl flooring type offers an impressive appearance along with impressive performance. If you are in search of new flooring that enhances your space while holding up well under the stresses of heavy foot traffic, multiple children, and even pets, this is the perfect option for you. We boast a selection of luxury sheet vinyl from some of the industry’s leading manufacturers, such as Downs™, Floorcraft™, and PURstone®. Our knowledgeable flooring experts help you navigate through our vast inventory and find the ideal option for any room in your home. In addition, we educate you about the beneficial features of each vinyl product, ensuring you feel completely confident when making a purchase. From selection to installation, our team partners with you every step of the way. Along with common sheet-style vinyl, we also offer vinyl options that mimic the plank shape of high-end hardwood. Exemplary customer service goes beyond our showroom floor and into the homes of our clients. Our experienced in-house technicians cater to all of your floor installation needs. Whether you are interested in classic wood vinyl plank or attractive luxury vinyl tile, our team installs your ideal flooring with speed and skill. To prove our commitment to your satisfaction, we back all installations with a promise called the Ultimate Confidence Guarantee. 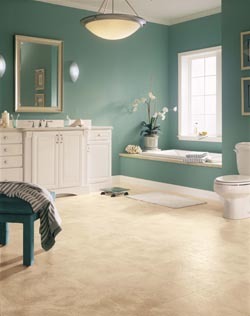 If you are unhappy with any aspect of your new flooring, we will replace it with a comparable product free of charge. If you want to learn more about the inventory of resilient flooring that we provide, contact us, and visit our local showroom today! To avoid a trip, all you have to do is call <PHONE>. We proudly serve the luxury vinyl needs of residents throughout Greer, Greenville, Spartanburg, Easley and Anderson, South Carolina.